In April 2004, Andrew Small and Christopher Rischmiller decided to bring quality back into the motor trade. Employed as experienced fitters for many years, they became increasingly disappointed with the glazing industry, due to the poor standards of materials, fitting and customer care. 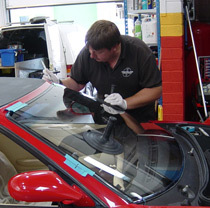 Unwilling to compromise their standards and job satisfaction they became partners and established Firstglass Automotive Glazing. Firstglass is a successful, professional business with a reputation for high standards, quality and care. Serving private customers and commercial & motor trade businesses in Dorset & Hampshire. It continues to provide a reliable, personal service and over the years has expanded into other specialised areas, including van conversions, van windows, sunroofs, panoramic glass roofs. So what makes Firstglass a cut above the rest? Priding ourselves in providing consistent quality of workmanship, with a personal, reliable service. Listening and understanding our customers' needs is very important, as is the ability to inform and answer customer questions and queries. You know you will get a first class job when you use Firstglass. Firstglass always strive to find and develop new and improved methods, using only the highest quality products. You can always be confident that all glazing is fitted correctly and safely retaining the original structure of the vehicle. Firstglass has a reputation built on recommendation and local vehicle dealerships and body repairers who care about quality use our services. For competitive prices with a polite and courteous service from specialists with years of experience and in-depth product knowledge, be sure to make Firstglass your first choice.